How will the town of the future look? 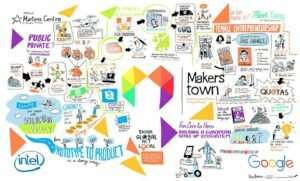 MakersTown seeks to answer this question through a unique showcase of the most cutting-edge developments in the Maker Movement. On June 20th, 2017, in Brussels, they will set up a village with different thematic areas to showcase the Makers most recent and innovative projects to the public using stands, workshops, and audiovisual elements. Open, fresh and bold panel discussions will take place to bring together leaders of the Maker’s Movement, business leaders and European policy makers. If you are a Maker and are interested in taking part, you can apply here. More information on MakersTown can be found here (pdf).